Though I haven’t seen a lot of them in the United States (yet), when I was in Europe it seemed like everyone was riding a folding bike. In fact, I can’t recall seeing anyone in Dublin on any other type of bike when I was there in December! After seeing so many people riding these, I started looking into them myself. What I discovered is that this type of bike is really cool and many models are very affordable in the under $500 – $1,000 price range. 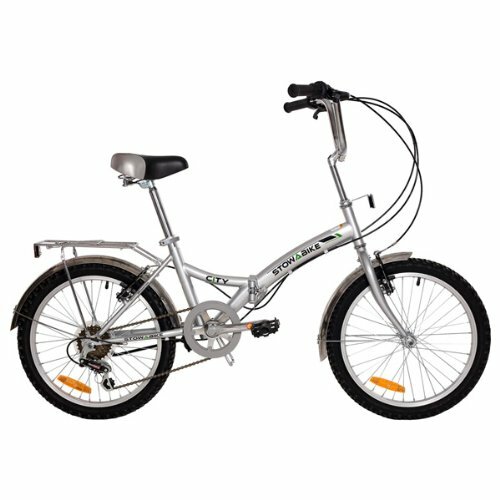 Whether you’re also new to this type of bike or are just looking for a good entry level folding bike, then keep reading for more information. This guide is designed to be a useful tool in learning exactly what to look for when you venture out to purchase your very first folding bicycle. Do not think that you have to sacrifice all of the aspects that have made you fall in love with cycling in the first place because you have decided to invest in a folder. If cycling has become a way of life for you – or at the very least, an integral part of how you transport yourself between point A and point B, the folder can be yet another tool to make your life glide more easily. Why Get A Folding Bike? 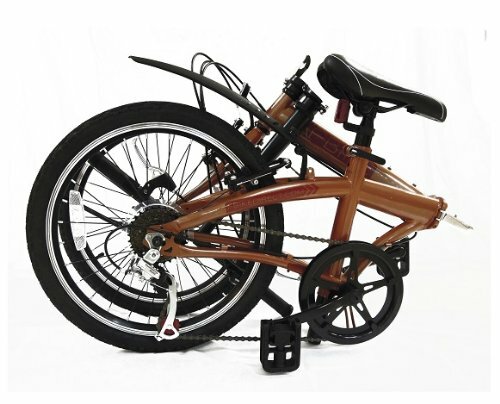 By definition a folding bike or folder is a cycle that is a self-possessed transformer. The only thing you need to “fold” this bike into a carry-on is your hands – no tools required. Anyone can ratchet off a wheel and put it onto a bike rack. With a folder there is no need to sweat whether or not someone has made off with your way home. You take your folded, compacted bike with you on the bus, train or anywhere. Riding folding bikes are a trend that has been around for a long time and is currently seeing a lot of new road – no pun intended. You are wrong however if you think that it will never catch on in the United States as the craze has lit up the United Kingdom. With people becoming increasingly conscious of their carbon footprint and their internal concern about how their lifestyle impacts their environment, cycling has deep reaching significance. Though there are some folding mountain bikes on the market, I think the primary rider for this type of bike is someone who normally rides a road bike. I definitely see this as a more of a commuter bike. And what’s great about a folding bike vs a road bike is that you can more easily take this type of bicycle onto public transportation or anywhere else that you need to go. In fact, you can even take it right into your office and store it under your desk during the work day! Can’t do that with your regular ole road bike, eh? As you can see, I definitely understand the benefits of a good folding bike for the urban commuter. I work from home, so this isn’t really ideal for me, but definitely check one of these out if you bike to work. This mode of transportation may very well become a standard among commuters in the States. In addition to being a commuters best friend for either part or all of their commute each morning and evening folding bikes have other unique uses. Bikes that can be stored in minimalist fashion is another great feature of the folder for people who may not have a lot of space to keep a cycle. The advantages and uses of folding bikes are endless since it truly assists the individual greatly while lessening noise and air pollution – thereby assisting the community and world at large. Because folders are an ideal tool for commuters and a positive answer to the myriad of debates on the downfalls of the impact of commuting, they have all of the advantages of regular cycling and then some. 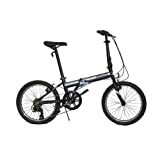 Practically speaking the most important advantage of folding bikes is their unparalleled foldable quality. Folding bikes used to be of a substandard construction because of their very nature. Now the technology has advanced to the level where high quality folders which can endure for extended periods of time exist and function well no matter how many times they are folded and ridden. As a result of its folding mechanism these bikes are ideal for superior use and then its transformation to a carry on package. Folding bicycles are all the rage in England where you will note many people exiting the commuter trains, then quickly unfolding their bike and taking off. Of course cars are still for sale in the UK however the use of folding bikes is a very frequent mode of transport. In America the lone bike that is locked in place at the commuter rail is a rarity less more a folder observed on a commuter rail luggage rack. Such sightings are far from rare in England. You can see that many commuter rail stops are preparing for the folding bike onslaught in America. Newer trains are being built with commuter racks to accommodate the dimensions of some folding bike models. There are also racks along each side of the typical commuter train car. The commuter stuck in the immense car congestion present in such hubs as Los Angeles and New York would breathe a sigh of relief if the folding bike revolution would take off. The folding bike is perfect for storage solutions as well. Once the commuter arrives at their work place – raring to go after a great bicycle work out – they can simply fold their cycle once again to tuck neatly in a locker area or even under their work desk. Storing the folder at home is also simple as it can easily transform into a stowaway for a closet, hallway or even under a bed. Another mode of self propelled transport once the feet have done their job the folder joins and propels the individual forward while keeping said human fit and cleansing the world of unnecessary fuel fumes. In this way, the bicycle becomes an extension of the individual. Folding bikes come in handy just for good old fashioned biking fun. These bikes are great tools for you enjoyment and come in varying biking varieties including single gear and multi-speed models. The added facet of folding makes it an additional boon to your bicycle lifestyle economy. Okay, you’re not crazy now you know you are onto something. 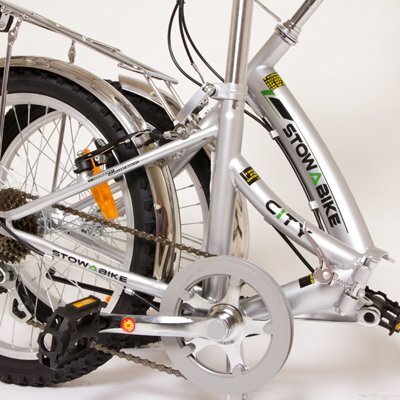 Lets take a look at the some of the different types and brands of folding bikes you will encounter in the market place. These are just basic guides of some of the models that are available in each brand category. Like a regular bike, many of these bikes can be customized to fit your specific needs. Brompton – is a brand that carries a 16 inch wheel folder. This bike literally has your unique name on it. 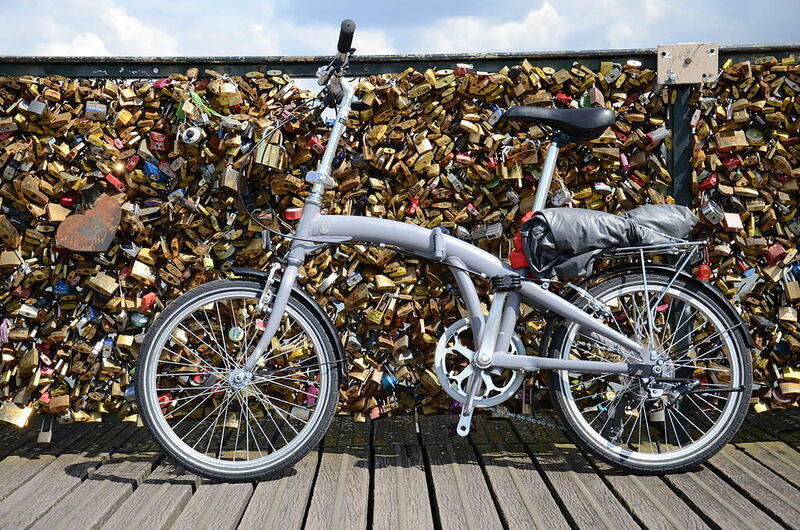 Brompton come in a variety of shades, gears, handlebars and luggage capacities. It is a fully customizable tool so bike enthusiasts can get their unique combination of style, speed and accessory with their machine. 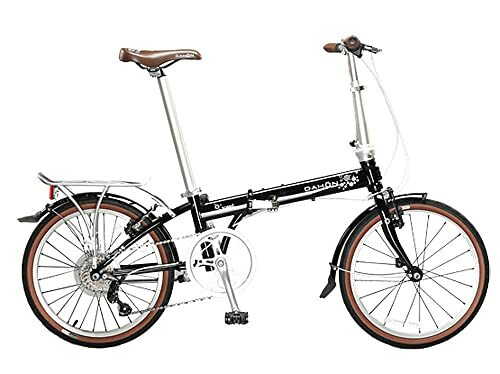 Brompton and the fold?… – this particular folding bike features both a frame hinge and a handlebar that folds. Once done your folded Brompton is not much wider than its 16 inch wheels. In addition the long seat post of the bike completely collapses into itself and becomes the mechanism that holds the compact Brompton in place. The triangle scoots up beneath the frame of the bike. Last but not least the pedals themselves fold all to create an easy totable tool which rides like a maven. If you want a bigger ride you may be in the market for a Montague folder. This brand has a huge array of folding bikes but also features a 26-inch wheel version that will satisfy the bigger ride bike enthusiast. Montague has a hard tailed mountain bike that actually folds so you can have a great road experience and then pack it all up and carry it away. Riders report no compromise with the fold. The Montague does not overbuild on the frame of the bike in order to over support the fold. how can you fold the Montague’s 26-inch wheels? – simplest answer is you don’t. The folded Montague places the wheels vertically side by side. Though the handlebar does not fold it – along with the fork – shifts left in its folded stance making for a easier transported tool which is not much wider than the wheels. a little Birdy? – fold them – for a little bike this bird has a whole lot of fly. At first glance you may think that you’ve come across a Brompton because of the smaller wheels, (the Birdy’s wheels are a little bigger as they come in at 18 inches), however this is a bird of a different feather. Because it does not have a hinge in the frame there is a not a lot of flex lending to a nice, stable ride. The Birdy also has a suspension system in place on either end of the cycle. It takes bumps in a single bound. flipping the Birdy – we mean in a good way of course – folding the Birdy is simple and when done correctly takes all of about 15 seconds to accomplish. The wheels invert inwards towards each other while the seat stem collapses into itself and the handlebars. Well gold star if that is the sparkle you want to adorn your folder with but we mean what are some of the special items you want to be on the lookout for before you purchase. A folder is not the type of bike that requires a certain skill set. Again any bike you are comfortable with riding more than likely comes in a folding version. As with any bicycle, you must be comfortable adhering to the rules of the road, commuter bike guidelines as well as the mandates set forth by the jurisdiction you may reside in. Your level of cycling comfort will inform if you are ready to make a commitment to cycling for whole or part of your trip to and from work. Since you may go with a folder for reasons other than or in addition to commuting we will focus on special features that enhance folding ability. Folding Pedals – some models include this feature which gives the cycle increased convenience due to decreased dimensions. Think about the fact that a standard bicycle pedal is about five inches wide so if those inches are condensed and scooted inward to mesh with the frame your bike is approaching the level of fierce fold-ability. What is the Folding Bike Made Of? – definitely be mindful of what metal is used to construct the riding tool. Aluminum is the preferred metal due primarily to its lighter weight. Folding bikes are to be carried. Therefore constructing folders with heavy metals would be counterintuitive. Look for aluminum construction or cromoly steel. Folding Handlebars – ask the expert at the shop about this feature because it will make a dramatic difference in the fold of your bike. Bicycle handlebars can be as wide as 20 inches. As a cyclist it is certain you have personal preferences in this area. As an enthusiast you may have a pinchon for a particular type of handlebar depending upon the type of bike you happen to be riding on that day and for what purpose. Spend sufficient time on this point as it will make a difference in ease of stow and carry. Extendible Seats – are important as it gives you considerable diminishment when collapsed into itself. The seat rod is sometimes used as the backbone of the folded components and the sear is a carrier of sorts. Purchasing a folder is yet another leg on your cyclist journey. Most riders go for the fold as an extension of their commitment to their own physical fitness and lover of the environment. In your sacrifice of comfort do not leave any details out or stones unturned. Hence, this guide to help you know before you go. As a cycling enthusiast just like any other bike purchase when you must consider your personal preferences when you open your wallet and dole out the dough for your folder. In days past the folder was a compromised tool since builders made the ride secondary to the ability to fold. Today you can have the best of both. Knowing how you like to ride – fixed gear, speed, mountain etc. will inform your decision best because there is a folder for every standard bike. The ability of your riding tool to transform into a compact, folded bike is an added benefit that doesn’t have to negatively impact the ride if you choose wisely. Some may opt to make this a weekday bike and have their dream ride only on the weekends. Strongly consider your own individual desires and needs before you hit the marketplace. Good grace and happy trails! If you’ve decided that a folding bike is the best choice for you over a cheap road bike, then you’ll find a lot of different models, features and options to choose from. 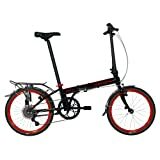 To help make your shopping experience a bit easier, I’ve checked out all the best selling folding bikes for 2016-2017 and narrowed them down to just the top affordable folding bikes that will fit a small budget. 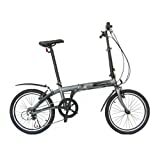 There are a lot of good folding bikes under $500- $1000 bucks, if you’re looking to get one for a low price. 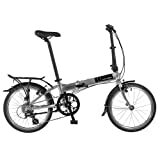 No matter what you’re shopping for, you can speed up your shopping with my folding bike reviews. This one is the lowest priced models to make the list. With that in mind, it’s probably the best value folding bike for the money right now. It has a very affordable price that should be able to fit most budgets. I like this bike for commuting as well as just going on short errands. I really like the look of this cheap, collapsible bike. 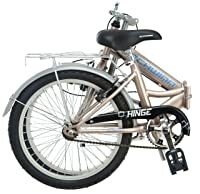 It has a nice silver finish frame, which keeps it gender neutral and perfect for both men and women. And probably my favorite thing about this one is that it has mud guards built-in already. In my opinion, this is PERFECT for keeping your suit or other nice clothes from getting mud splatter on them if you get caught out in the rain. That’s a really nice feature to have for your commute. Other notable features include: built-in carrying rack, safety reflectors, 6-speed Shimano rear derailleur, kickstand, and total bike weight of 35 pounds. The seat is adjustable and the bike can handle a capacity of 280-lbs. So, this isn’t ideal for someone who is overweight or a big person, but it will work for a lot of people out there. The handlebar doesn’t stow away easily for storage, which is really the only negative thing that I have to say about this folding bicycle. Putting this one together is easy. Shifting is smooth and, like most bikes, the saddle could be a bit more comfortable. Overall though, this is a sharp looking bike that performs well at the price. Honestly, this is a dirt cheap folding bike that is surprisingly decent. Probably the highest priced model on this list, this one still comes in at a very affordable cost. And, you get a hell of a lot of bike for the money with this model. You can really tell a difference when you ride this bike compared to the others. It is a much smoother ride overall. In terms of features, you get the built-in mud guards, a lightweight frame (just 27.6 pounds! ), 7 speed, sporty styling and an overall fun ride. What’s really interesting about this bike is that you feel like you’re on a full-size bike when you ride it. Assembly is quick, and you folding it up is even faster. One important thing to note with this one is that weight limit is a very low 230 pounds. This eliminates a lot of bigger guys and overweight ladies. 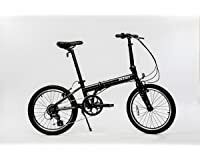 That being said, do know that this is a good folding bike for tall riders as it can fit someone up to 6’4″ tall – as long as you are under 230 lbs. Bottom line: I think that this is a pretty fierce little folding bicycle that packs a lot of punch. If this isn’t your first time on Active Weekender, then you already know that I have a love-hate feeling for Schwinn bikes these days. 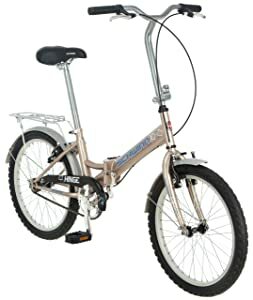 And while I stand by the fact that Schwinn bikes aren’t as great as they were when I was a kid, this Schwinn folding bike is a pretty decent buy. For real. Now, obviously, it looks wicked cheap compared to the D7 above, right? That’s because it is a bit lower in price. So yeah, it’s a cheap folding bike. But hey, if you’re on a budget and just need the basics, then this is a good option for you. This model is similar in price to the Stowabike model listed above, but in my opinion it is a slightly better option. Why? Because it folds up smaller – you don’t have that pesky handlebars issue with this one. This is one HEAVY bike though! Seriously. It weighs in at 38 pounds! If you’re carrying this up the stairs to catch the train, then that will get mighty heavy real quick. That’s a big negative for me because I don’t want to be carrying around almost 40 pounds, especially when the D7 is over 10 pounds lighter than this one! 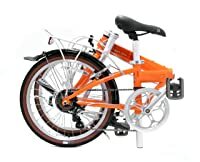 Though that is my personal preference, I definitely think that this is something you should consider when comparing this folding bike to the other models on the market right now. The rider weight limit for this bike is 220 pounds, which is not a lot. I’ve seen other riders mention it holding more weight, but it’s really up to you if you want to test out the frame like that or not. This is another good, cheap option with a price well under 500 dollars. This was a new-to-me brand, but I’ve since learned that fBIKE is based out of Boston. I only mention this as a lot of people prefer to buy from American companies and this small USA-based business definitely meets that criteria. 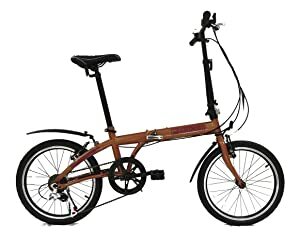 I think that this is a very affordable folding bike with some nice high quality components for the money. It has pretty much the same basic features as the other bikes – mud guards, kickstand, bell, etc. This one also has the 6-speed Shimano rear derailleur. The frame is made of steel and clock in at 31 pounds. So, not the most lightweight, but definitely not the most heavy bike either. This folding commuter bike has a weight limit capacity of 225 pounds, so not a good option for heavier people. It rides smooth and is easy to fold up for storage. I really like that it comes with a strap to hold the wheels together when folded and stowed away. I keep seeing people saying that this one really gives the D7 a run for it’s money, but I haven’t had a chance to try them head to head. If you do, please let me know what you think! 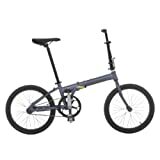 Bottom line: I believe that this is a high quality folding bike with a good, low price – definitely a top contender to consider.